SAVANNAH, Ga. (WXIA) – The Georgia Legislature has a message for voters: don’t ask us about our meetings with corporate lobbyists behind closed doors. Orrock would know. She was once a member of ALEC. “The corporations that are there have equal standing with the legislators,” Sen. Orrock said. “You mean they can vote?” we asked. “They absolutely can vote, and truth be told, they write the bills,” she answered, referring to the lobbyists. There really are back rooms where corporate lobbyists have direct access to lawmakers completely out of sight, with no transparency or public filings. They’re also wined and dined after hours at these events with nothing recorded on ethics reports. Inside we saw Bethanne Cooley, Director of State Legislative Affairs for CTIA – The Wireless Association. She’s a top lobbyist for the cell phone industry, registered in other states, yet she’s not registered as a lobbyist in Georgia. Even though Cooley was talking about legislation with Georgia Rep. Ben Harbin and other lawmakers behind closed doors in Savannah, CTIA told the 11Alive Investigators that Cooley was not lobbying under Georgia’s legal definition. The money CTIA pays to ALEC is not considered a lobbying expenditure, even if ALEC used the same dollars to pay for the food, drink, and hotel for Georgia lawmakers in Georgia. The 11Alive Investigators filed half a dozen open records requests with Georgia senators and representatives, asking for receipts and reimbursement records for travel to ALEC events. That’s right, lawmakers exempted themselves from a law they passed to make Georgia government more transparent. But that doesn’t stop some lawmakers from talking about the perks to complete strangers in the hotel bar. Months before the conference, my family booked a hotel room at the same resort as ALEC. At the hotel bar, I struck up a conversation with a state representative from New England. We later verified his identity as an ALEC state chairman. Sitting next to him at various times were three different self-identified lobbyists who also didn’t mince words about why they were there and who was really paying for the event. “We pay more to be here, so it helps support them,” one lobbyist explained to me, not knowing I was an investigative reporter. She was referring to the state legislator between us, responding to his request for donations. ALEC recently started calling these grants the “state reimbursement fund.” Before that, the grants to lawmakers were called “scholarships.” ALEC is a 501(c)(3) educational charity. Its stated mission is to ‘educate’ state lawmakers, with industry leaders doing the educating. Nationwide records of ALEC scholarships were released as part of an open records request in Florida for the years 2006, 2007, and 2008. In those years alone, Georgia lawmakers received more than $170,000 in ALEC scholarships to attend meetings at resorts across the nation. What are these resort meetings all about? By all accounts, the goal is to create new laws in all 50 states. ALEC Task Force Summits, like the one in Savannah, produce ‘model legislation’ that is later approved at the annual meeting. These are ready-made bills with actual blanks where legislators can fill in their state’s name and existing code. Several laws currently on the books, under which Georgians are governed, were born in back rooms at resort hotels. Georgia’s Asbestos Claims Priorities Act severely limits who can file asbestos claims against corporations in the state. It was passed in 2007, the same year its sponsors received thousands to attend ALEC conferences. The co-chair of the ALEC task force that year was a top corporate defense lawyer. The 11Alive Investigators tracked the asbestos bill all the way to the place if its birth: The Venetian Hotel and Casino. The Georgia law began as ALEC model legislation first approved in a hotel meeting room in Las Vegas. You can compare the two documents for yourself to see how several clauses match word for word. The three sponsors of the bill in the Senate received more than $22,000 combined the year before, the year during, and the year after the asbestos bill was passed. Speaker Ralston was the lone sponsor in the House. What does ALEC have to say about all of this? Not much. We sent two requests to the organization’s media representatives weeks before the conference asking for a list of ALEC members in the Georgia legislature. The organization once boasted one third of the Georgia legislature as ALEC members. We got no reply to our requests. Reporters have been denied credentials to cover ALEC events, while others who received ALEC credentials were barred from covering the closed door task force meetings where potential laws are discussed between publicly-elected lawmakers and corporate lobbyists. The 11Alive Investigators already have media credentials to cover both houses of the Georgia General Assembly, so we went to Savannah with those credentials displayed. We walked through an unlocked door into a committee meeting room where we were allowed to remain for a few minutes. When were asked to leave by an ALEC staffer, we immediately left the room, but peppered her with questions in the public hallway. “You need to be credentialed at registration,” the unidentified ALEC staffer said. We showed her our Georgia Senate and House credentials. She indicated that those were not good enough for us to observe Georgia lawmakers discussing legislation in Georgia. Instead of answering, she called over a sheriff’s deputy, one of six off-duty police officers we observed taking their orders directly from ALEC staff members. He called three of his fellow deputies as back-up. Then we were approached by Bill Meierling, ALEC’s Vice President of Communications and Public Relations with the four deputies keeping a close watch on us. Surely he would be able to answer our many questions. “Can we interview you?’ I asked. “Actually no,” he answered. According to ALEC’s tax exempt IRS filings, Meierling receives a six-figure salary to deal with the media, but instead he asked that we turn off our camera. What was there to hide? 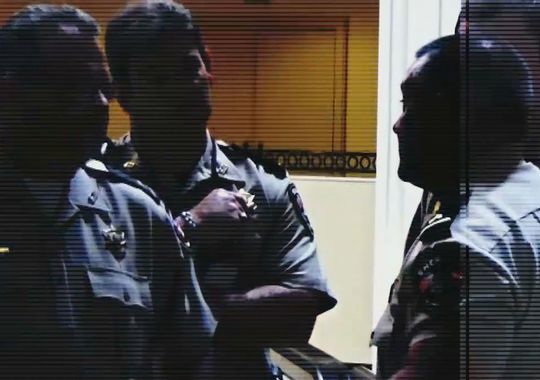 When we refused to stop recording our interview with him in the public hallway of the hotel, Meierling said, “OK, well then I’d like to have you escorted out of the building please.” He motioned to the deputies. “You are staying at this hotel?” Meierling asked. We decided to ask our questions. Prison Labor For Big Corporation Is The New American Slavery & Most Unknowingly Support It!